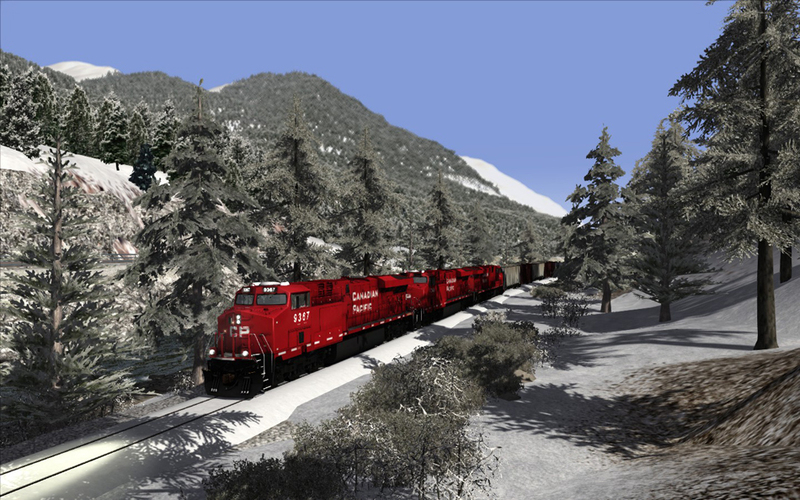 The route is set in the Rocky Mountains of Western Canada in Alberta and British Columbia, featuring the most interesting 155 mile section on the Canadian Pacific® mainline between Calgary and Vancouver featuring two mountain passes Kicking Horse Pass and Rogers Pass. The route is set in the present day and features part of the Laggan Subdivision, the entire Mountain Subdivision and the northernmost 3 miles of the Windermere Subdivision to include the large yard to the south of Golden. The route starts at Eldon around 10 miles east of Lake Louise. Between Eldon and Lake Louise the railway follows the Bow River passing the curve made famous by Canadian Pacific's Official Photographer Nicholas Morant now known as Morants Curve. When the second track was built between Lake Louise and Stephen the yard and facilities from Lake Louise were moved to Eldon. At Lake Louise the line splits, the northern track has a reduced grade of just over 1%, while the original southern track has grades of up to 1.8% to Stephen at the summit of Kicking Horse Pass on the Alberta/British Columbia border. From Stephen the line descends to Golden. Between Partridge and Cathedral the line descends using the Spiral Tunnels on a 2.2% grade. 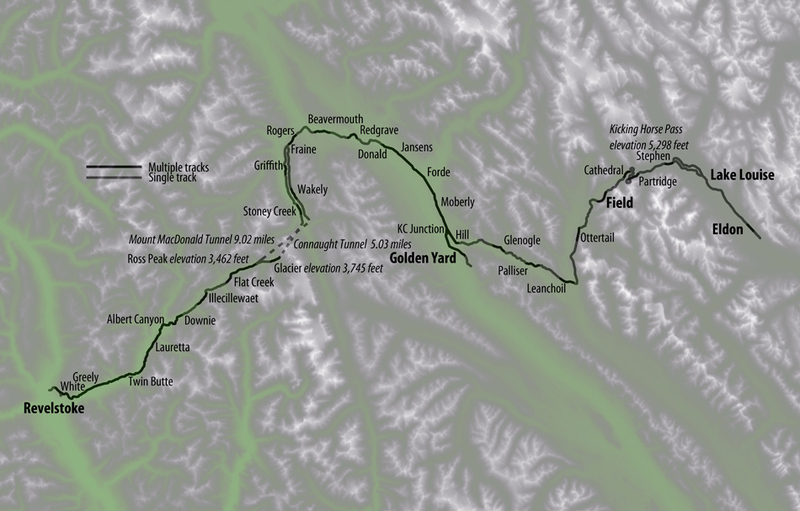 Field is a division point on the railway with the Laggan Subdivision to the east to Calgary and the Mountain Subdivision to the west to Revelstoke. All trains stop here for a crew change. From Field to Leanchoil the line is relatively flat, but at Leanchoil the line descends on some grades exceeding 2% into Lower Kicking Horse Canyon into Golden. At Golden there is a small yard at Hill on the mainline but the main yard is about 3 miles south on the Windermere Subdivision. The yard is mainly used for stabling and servicing coal trains which come from the Crowsnest Pass area to join the mainline at KC Junction just west of Golden. The line from Golden is now mainly double track most of the way to Revelstoke as the coal trains have joined the traffic flow. West of Golden the line follows the Columbia River flowing northwards through the Rocky Mountain Trench. The line is flat and the fastest section of the route is to Donald. West of Donald the line goes down to single track next to Kinbasket Lake, which was created when the Kinbasket Dam was built on the Columbia River resulting in having to reroute the railway. At Beavermouth the line turns away from the Rocky Mountain Trench leaving the Columbia River behind and starts the climb up Rogers Pass. At Fraine the line splits in two with the Connaught track having grades of up to 2.2% and the MacDonald track having grades of just over 1%. The Connaught track crosses the famous Stoney Creek Trestle; the highest railway bridge in Canada which has been used in numerous publicity photographs for Canadian Pacific® over the years. The Connaught track enters the Connaught Tunnel which it exits at Glacier in Glacier National Park. The MacDonald track climbs the valley below the Connaught track before going into the Mount Shaughnessy Tunnel and then the 9 mile long Mount MacDonald Tunnel. Both lines join up again at Ross Peak where they descend in the Illecillewaet Valley to Revelstoke, on grades of over 2% in places, until Albert Canyon where the line flattens out a bit for the final approach into Revelstoke. Revelstoke at the west end of the route is another division point on the railway with the Mountain Subdivision to the east to Field and the Shuswap Subdivision to the west to Kamloops. Revelstoke has large yards and is another crew change point for all trains. Of note, Revelstoke is on the Columbia River, which the railway last saw at Beavermouth flowing northwards, but now is flowing in a southerly direction through Revelstoke. The railway could have avoided Rogers Pass by following the Columbia River but this would have resulted in a much longer route.